Are you a student ambassador interested in developing your skills and employability? Want to meet and learn from other student ambassadors? 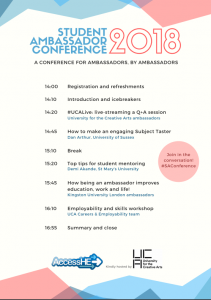 Join us at the AccessHE Student Ambassador Conference 2018! Click here to download the event timetable! Now in it’s fourth year, the AccessHE Student Ambassador Conference brings together experienced student ambassadors from a number of different universities to learn from each other and celebrate the work of ambassadors in outreach and widening participation. You can download a promotional flyer here. • enhance your employability by participating in a workshop designed specifically for student ambassadors. The Conference will take place from 2-5pm on Wednesday 14 March 2018 at UCA Epsom. Directions to the campus and further information can be found here. There are regular train services to Epsom running from Waterloo, Vauxhall and Victoria stations. As there is a limit of ten ambassadors per AccessHE member institution and a small charge of no more than £10 per ambassador to the institution to cover event costs, Student Ambassador Managers have been asked to nominate students to attend the event. If you have been sent this link by your scheme manager, please click on the ‘book to attend’ link below. Places are then allocated on a first-come-first-served basis. However, we hope to record all of the sessions so that they can be viewed by other ambassadors after the event. If you have any questions about the event, don’t hesitate to contact Sam Turner, London Programmes Coordinator, at sam.turner@londonhigher.ac.uk.